If we can sell more than qty :2500++ Belgium choc cake SOLD 2014 , it cannot be wrong ! Using the best of the chocolate to offer rich dense choc cake with special designed Macarons , it cannot be wrong ! well how do we eat this tall babe ? each quadrant can be shared by 3 ..
rainbow cake had been around for sometime , and honesty - I am always requested to make the reainbow cake for my customized sries . however , it is usually for me to observe that not many players offers a uniform control thickness and perfect texture to give a perfect visual treat . Delivery services avail , pls call to confirmed . Our Handmade French Macarons is made carefully by our in-house baking Chefs/ Patissier previously from the internationally renowned Fauchon Paris. Each macaron is filled with finest quality cinnamon ganache. The blend of infused cinnamon taste and combined with Belgian white chocolate create an exotic festive flavor that surely compliments our British fruitcake. Our magnificent Christmas Macaron tower cake is the perfect centerpiece for this special festive season. It can make your occasions even more memorable and special. This elegant work of art is sure to impress your guests. Many of us love the traditional British fruitcake covered with smooth look of icing for Christmas cakes. Cakeinspiration together with their talented team of Artists and Patissiers came up something beautiful different look of homemade traditional fruitcake. A simple cake turns to modern look but still preserved the moist and taste of traditionally homemade fruitcake. Fruit cakes are often served in celebration of Christmas. It has historical associations with the Holy Land, and its internal bounty is said to represent the gifts of the Wise Men. Like many other fruit breads and cakes, it has been venerated since Medieval times when fruit in the wintertime was an extraordinary treat. Because the fruit came from the Holy Land, it was also revered and saved for feast days, particularly Christmas and Easter. The British began their love affair with fruitcake in 1400s when dried fruits from Mediterranean first arrived. Since then, it was a British specialty. 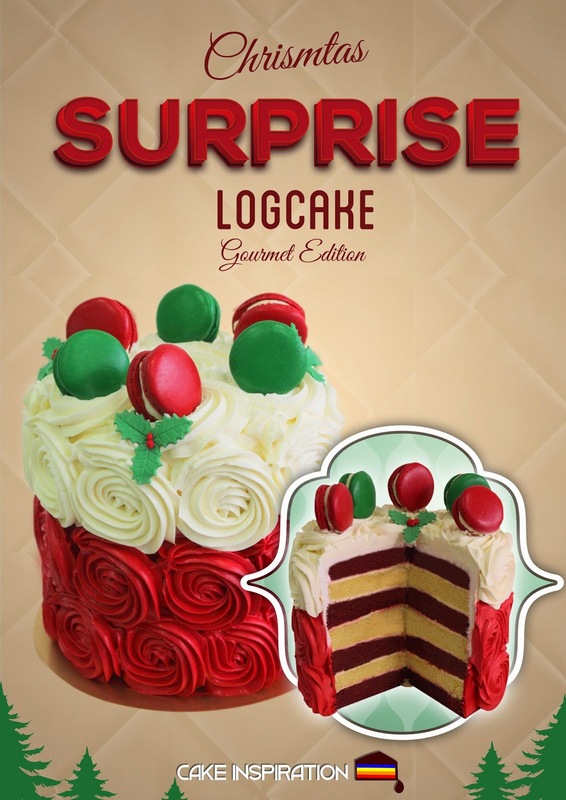 Cake inspiration fruitcakes are based on traditional recipe that are cherished among families. The cake is made with chopped candied fruits, nuts, and spices, and soaked inspirits. Our different version is covered with white satin fondant and decorated with a Handcrafted Santa Bear. 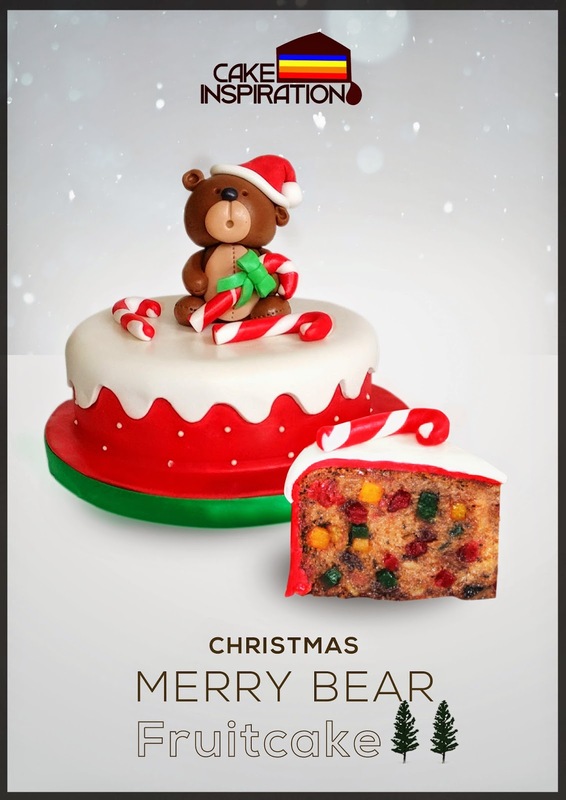 Our magnificent Christmas fruitcake with Handcrafted Santa Bear is the perfect centerpiece for this special festive season. 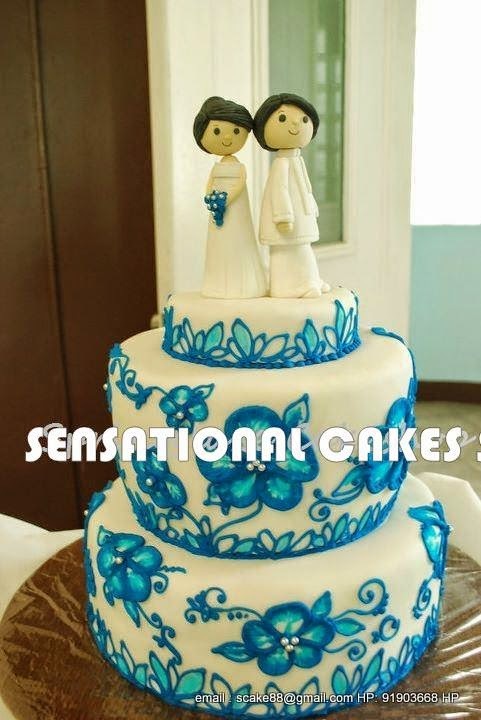 It can make your occasions even more memorable and special. This elegant work of art is sure to impress your guests. 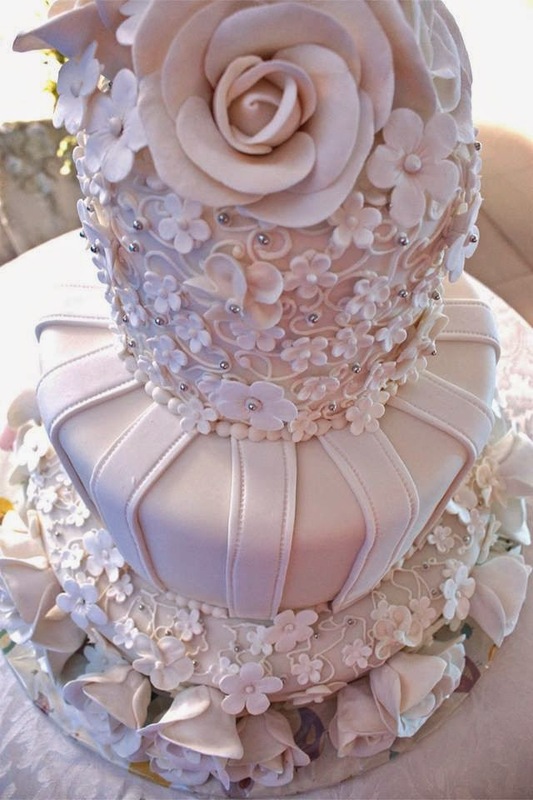 The height of the cake approx 14 cm; diameter of fruit cake is approx 6 inches. 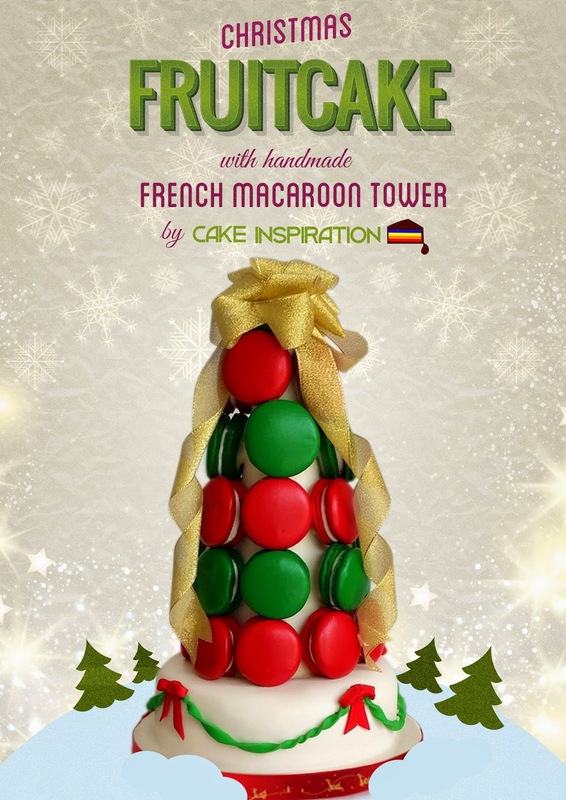 Instead of a simple Christmas tree cake, how about a traditional European fruit cake decorated with modern tower of handmade French macarons in the shape of a tree! If you’re dreaming of a white Christmas, you probably need some inspi-macaron-ation. This cake tree features brandy fruitcake base cover with white snow fondant and topped with French macarons. Fruit cake is a traditional British Christmas cake that is full of fruits and nuts and laced with alcohol, usually brandy. This gives the fruit cake a subtle brandy flavor and a moist texture, plus it also allows the fruit cake to be stored for a long time. The height of the cake macaron tower approx 29 cm; diameter of fruit cake is approx 6 inches.